Fiodrain Subsoil & Floor Drain | Drader Manufacturing Industries, Ltd. 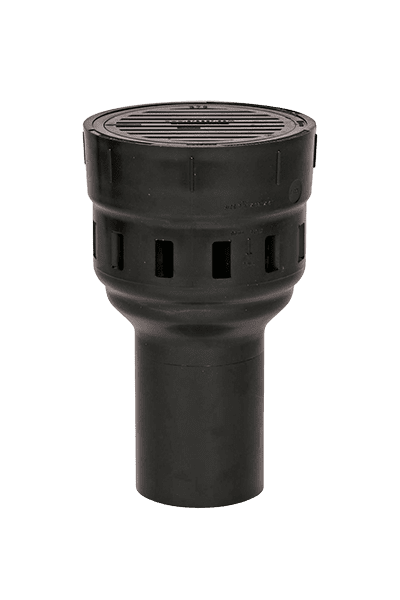 Innovative floor drain, subsoil drainage device, backwater valve—Our Fiodrain specialty product is ideal for the Plumbing & Construction industry. Our Fiodrain specialty product is a 3-function drain made of our most robust plastics. This innovative part serves as a floor drain and subsoil drainage device. It is easily installed in new and existing homes and buildings. Fiodrain water flow capacity includes seepage apertures, 33L (7.3 gal.) per minute and Floor grate 154L (32 gal.) per min. Note: If native soil condition indicates potential swelling, Geotechnical Engineering advice should be obtained. Fiodrain requires a net “HEAD” of 229 mm (9”) from top of Fiodrain grill to WEIR LINE for large ball check valve to work effectively (see detail “A” over).